Loaded with potassium and a good source of vitamins C and A, they are good to eat at any point during the ripening process, so there is absolutely no need for this versatile produce to go to waste. But never fear, if this cousin of the banana has you stumped - we’ve got the lowdown to help you get plantains into your cooking rotation. Plantains contain more starch than sugar, so unlike a banana, they should be cooked before eating, and will become milder, softer and sweeter over time. Store them on the counter at room temperature to help the ripening process along. 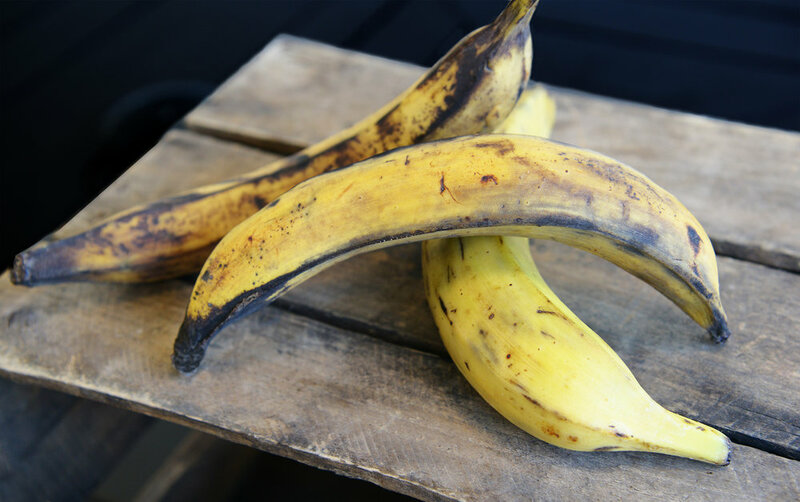 Fully ripe plantains (with black skin) can be kept in the fridge and also freeze well after they have been peeled. The best way to peel a plantain is to cut off the ends, score the skin lengthways along the seams, and then pry the skin off with a knife. When yellow, the skin should also be scored crosswise. GREEN PLANTAINS are firm and starchy and can be used however you would normally use a potato. Prepare them by boiling and mashing them or try frying them like traditional Puerto Rican Tostones. Because cut plantains oxidize quickly, it is a good idea to prepare a light brine that you can place the cut pieces in until you are ready to cook them. YELLOW PLANTAINS WITH BROWN SPOTS should feel slightly firm to the touch and are at their peak time for eating. A little sweeter in flavor, they are good baked, fried or mashed. An easy and delicious method is to cut them in half lengthwise and put them on a baking pan coated with coconut oil. Brush the plantains with coconut oil and sprinkle with your favorite seasoning such as; salt, cinnamon, ginger or cayenne. Bake at 425° until tender and browned, about 30 minutes or so and serve with rice and your favorite protein. Although BLACK PLANTAINS might not look their best, this is when they are perfect for dessert. Incredibly sweet and a little softer, you can bake them as listed above or if you are really feeling decadent, sauté them in butter with a little vanilla, cinnamon, and brown sugar. Our farmers had to harvest their crop before the big rains hit. But because they are so heavy, they are expensive to ship and so the grocery demand was not there for such a large quantity. Their loss however, is our gain. We gladly rescued them and hope you will find a good home for them in your kitchen. Trust us, your belly will thank you.